Advanced SystemCare Ultimate is a powerful anti-virus and system optimization tool. Apart from protecting your PC from malware, viruses and similar threats, it can also boost your PC's performance by applying various registry and shortcut fixes, removing junk files, scanning local disk volumes for system vulnerabilities, etc. 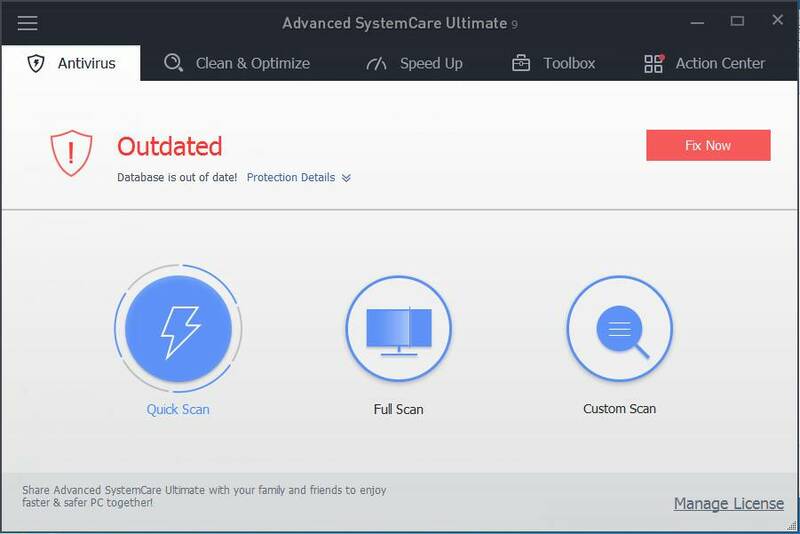 Based on #1 ranked BitDefender antivirus technology and IObit anti-malware engine, Advanced SystemCare Ultimate incorporates top anti-virus capabilities, as well as the already proven comprehensive PC tune-up ability. With real-time protection against viruses and spyware, Advanced SystemCare Ultimate 6 provides protection against all kinds of security threats, system slow down, freeze and crash without slowing down your system. Advanced SystemCare Ultimate is compatible with other security softwares like anti-virus, anti-malware, firewall, etc. Advanced SystemCare Ultimate is a stand-alone product. Besides the newly built-in antivirus functionality, it includes all the features of Advanced SystemCare PRO. PRO users who uninstalled Advanced SystemCare during the trial can easily revert it back at any time. No more worries about virus, spyware, adware, hijackers or any other E-threats. Your PC security is guaranteed with the combination of #1 ranked BitDefender antivirus technogly and IObit anti-malware engine. Unmatched detection rate assures you TOP PC security. No more performance lag while conducting antivirus scanning and repairing. Unlike most of security suites that consume too much system resources, Advanced SystemCare Ultimate does not affect system speed with the industry-leading security technology. The newly introduced Surfing Protection detects risky websites, while Proactive Virus Control technology monitors processes behavior in real-time, scans files shared with email and blocks possible threats that may harm your PC, ensuring you top online environment. Already proven PC tune-up ability fully optimizes your Windows by unleashing the built-in power of your system. New Internet Boost technology accelerates internet downloading, web surfing, online gaming, youtube viewing up to 300% faster. New performance monitoring technology makes you remain confident with your PC, by presenting you a dashboard to update your system performance in real time. It also provides a quick launch option to fix your problems faster. Turbo Boost, technology that terminates unnecessary services and applications, provides you a more efficient working and superb gaming experience. In addition, you can customize the configuration of different modes according to needs. Advanced SystemCare Ultimate integrates the latest IObit Toolbox for daily PC maintenance and advanced needs. 26 dedicated smart tools are included for system cleaning, optimizing and repairing, and security enhancement, providing you an all-in-one solution to fully control your system. Advanced SystemCare Ultimate works continuously, automatically and quietly in the background on your PC. You can set the program on regular schedule or just let it run automatically when your PC is idle.